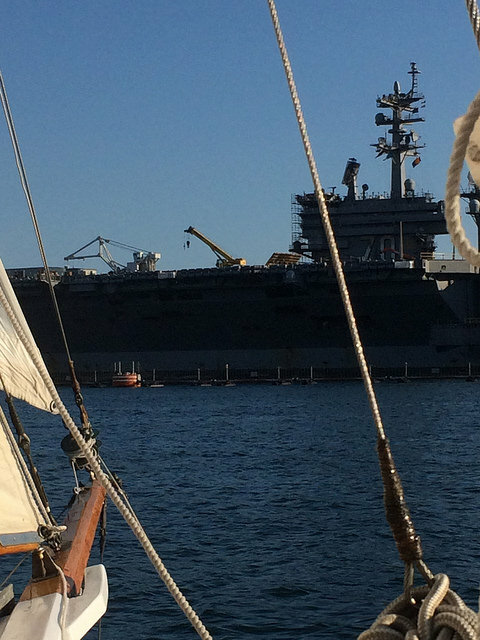 Best Sightseeing in San Diego Part 4: Military Ships! San Diego Bay is an extremely active harbor, shared by the military, Coast Guard, cargo ships, and li’l ol’ civilians like us. Watching the big ships in action is always a treat. This photo is of the United States Navy Nimitz-class supercarrier, the USS Carl Vinson. It can hold thousands of personnel and has been deployed to Iraq numerous times. There was also a NCAA basketball game between North Carolina and Michigan State played on its deck, with President Obama in attendance. Another harbor treat is the USS Midway, one of the best military museums, period. I learned that on any given day, the kitchen staff washed 5,000 trays every meal, 3 times a day. Don’t complain next time you do the dishes!